Just want to let you know I'm playing with the whole band (accordion, 4 percussionists, horns, etc.) 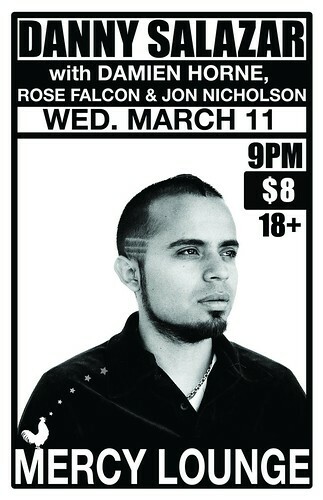 at the Mercy Lounge on Wednesday, March 11. We'll be playing music from the new CD and we'll also be trying out some brand new songs. Damien Horne will be starting the night @ 9pm with an acoustic set. Also joining us, will be Rose Falcon and Jon Nicholson. It's going to be an amazing show! Attached is a copy of the poster. Please help me spread the word and forward the poster to friends. Hope to see you there! Please call Lightning 100 @ 615.777.5100 and request 'Here I Go Again'. It's a song I co-wrote with Rose Falcon. They have a lunch hour request every day. You may email them, too @ studio@lightning100.com.